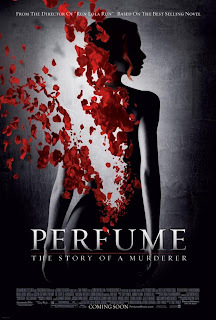 Perfume is one of the best films I’ve ever seen. Despite stumbling at the end, the film completely blew me away. The plot of the film tells the story of the life of a young man with the most amazing sense of smell. Obsessed by the world or aromas he eventually becomes an expert creator of perfumes. His desires eventually lead him down a dark road toward murder. I don’t know what to say. Despite having a cast that includes big stars the film’s actors including Dustin Hoffman all completely disappear into their roles. At no point will you ever be pulled out of the web the film spins by the appearance of a familiar face. What amazes me about the film is that by the simple use of sound and image the film creates a sense that stimulates the other three senses Watching this film you can feel, taste and especially smell this film. No I’m not crazy, I have yet to meet anyone who has seen this film who has not mentioned the sensory stimulation brought on by the film. And of course there is the story, which is absolutely riveting. This is story telling at it’s finest. Tom Twyker has managed to translate keep the wonder of the book and create a magical piece of cinema.